Claremont, Calif. (August 9, 2013)—Four Pitzer College students have been selected to give presentations at the Capstone Conference at The Ohio State University’s Mathematical Biosciences Institute (MBI). Brian Cohn ’14, Jacob Enslein ’15, Julia Filo ’14 and (Yoni) Samuel Rubin ’15 will present findings from research projects funded by a $3.6 million grant from the Howard Hughes Medical Institute (HHMI). The conference will be held August 12-16 in Columbus, OH. Cohn, Enslein, Filo and Rubin are part of the first group of students to receive funding from the 2012 HHMI grant, which provides funds for research and courses that incorporate quantitative and computational approaches to life science at the five Claremont Colleges (5Cs). Students from the 5Cs presented research posters at the W.M. Keck Science Department in July and seven students, including two from Scripps College and one from Claremont McKenna College, were selected by Keck HHMI faculty advisers to submit their presentations to the MBI this year. All were accepted. 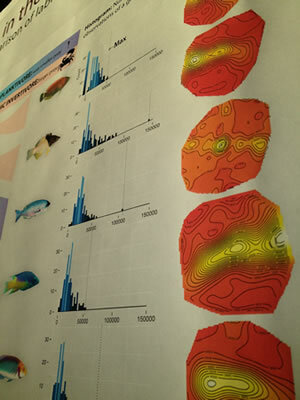 Cohn’s research project uses computational methods to generate 3D visual-resolution maps that allow researchers to visualize and compare the eyesight of vertebrates. Cohn is an organismal biology major at Pitzer. Enslein developed a mathematical model to determine whether the timing of seed germination affects plants’ survival rates. A biology major, Filo examined the effects of circadian clock rhythm on the leaf growth in Arabidopsis thaliana, a small flowering plant often used as a model organism in plant biology. Rubin, a physics major, studied a species of Californian mite that runs at record-breaking speeds, exploring how the mite’s mobility relates to its body mass. The Capstone Conference highlights recent work by students doing research in mathematical biology. The conference will also feature talks by prominent mathematical biologists and a graduate school recruitment fair.